Oliver Broom tells in the Guardian the story of the founding of Cycling Without Age, which in a couple of years has grown to providing extremely beneficial cycle taxi outings to residents of more than 150 care homes. 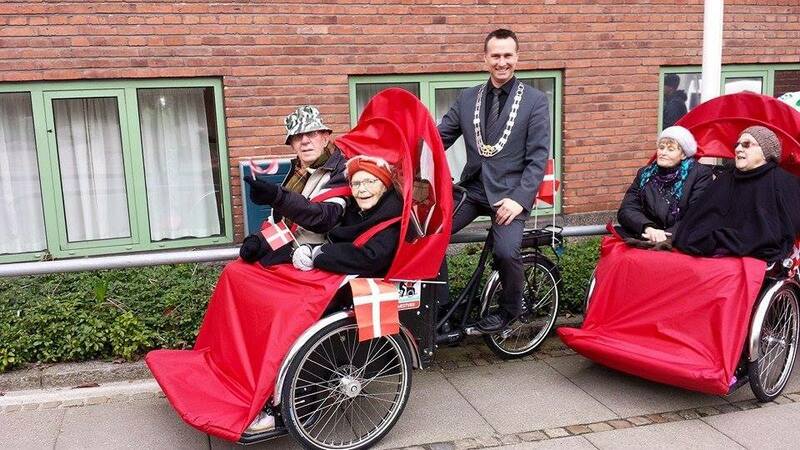 Thorkild Thim is a 97-year-old Copenhagener. He’s a former Royal Guard and entrepreneur who, for eight decades, used a bicycle to transport himself around his city. He lives in a care home now. The staff take good care of him and he’s fond of them but his legs aren’t what they were. He uses a frame to walk but most days he doesn’t get further than a wooden bench outside the front door. He sits alone, offering a smile and a wave at the people of his city as they pass, most of them on bicycles. Throughout early 2012 local businessman Ole Kassow often passed Thorkild as he and his daughters pedalled to school. One day he stopped for a chat with the old man. It turned out to be a life-changing encounter for both men. Kassow now spearheads a scheme that has captured the imagination of thousands of Danes, young and old; a scheme that is changing the way they think about old age. It’s called Cycling Without Age and, on a bitterly cold Monday morning before Christmas, I met Kassow in Copenhagen to learn more about how it came about. He is a management consultant by trade, in his mid-40s and, like most Danes, with an English accent that betrays his Nordic roots. He said it was curiosity, developed over a number of months, that encouraged him to speak to Thorkild in the first place. “Seeing this old guy sitting on his own every day outside a care home got me wondering if he used to cycle around the city, just like I do every day.” During their brief chat he discovered that Thorkild did indeed used to cycle, but that he was no longer able to. “The following week I borrowed a cycle rickshaw from a friend and went to the care home to ask if he fancied going for a ride.” Thorkild jumped at the chance.